For his 44th film, veteran director Claude Lelouche has made, on his own admission, his most autobiographical film to date dedicating this film to his seven childen by five different mothers. 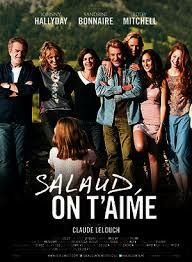 Salaud On t’Aime is a rambling tale of a father’s attempt to reconcile with his four daughters which is marred by woeful miscasting and a ridiculously contrived ending. Ageing French rock-and-roll superstar Johnny Halliday is Jacques Kaminsky, a war photographer who leaves his wife behind in Paris and sets up home with new love Nathalie (Sandrine Bonnaire) in the French Alps. His new abode has everything a man could want except the presence of his four daughters who refuse to visit. The daughters, who are named after the four seasons – Printemps, Ete, Automne and Hiver – all have different mothers and resent the absence of their father as they were growing up. His best friend Frederic (Eddy Mitchell) tries to help by telling the daughters their father is gravely ill and only has weeks to live. All four women rush to his side where old jealousies and resentments soon surface turning Jaques’ Alpine idyll into a conflict zone. Without doubt, the early part of the film is a visual delight. Set against the majestic background of snow-covered mountains, there is scene after scene of family dinners where the conversation and wine flow freely and everyone is suffused with a golden, beatific light. But, with a plot that is rapidly running out of steam, Lelouche abruptly changes tack and Salaud, On t’Aime descends into an absurd, and at times unintentionally comic, shambles. Lelouche has, in the past, cast non-professional actors in his films with varying degrees of success. And Halliday has tried his hand at acting before but this is a big role which requires a depth and subtlety completely out of his range. To paraphrase Dorothy Parker, Halliday “runs the gamut of emotions from A to B.” Perhaps Lelouche was banking on pulling in an audience based on Halliday’s enormous popularity in France. At 74 years-of-age, the singer is still filling concert venues around the country and his private life is a constant source of fascination for the French public. But you need to be good to match someone of Bonnaire’s calibre. Even her qualities as an actor cannot turn this film around. 1993 Tout ça… pour ça!